Heel pain is common when you spend most of your day up on your feet, but when when the harshness is long lasting and more severe, you could be living with plantar fasciitis. Heel pain is common when you spend most of your day on your feet, but when the harshness is long lasting and more severe, you could be living with plantar fasciitis. Every year, approximately two million people in the U.S. are treated for this condition, according to the American Academy of Orthopaedic Surgeons. Additionally, plantar fasciitis is one of the most common causes of heel pain. The plantar fascia refers to the bottom surface of the foot – stretching from heel to toe – that is a strip of tough tissue surrounding the muscles. When this bowstring-like ligament becomes chronically inflamed, plantar fasciitis occurs. Tight calf muscles – Making it difficult to flex your foot and stretch the plantar fascia. A high arch in your foot. Repetitive impact activity – Participating in sports that involve lots of running. 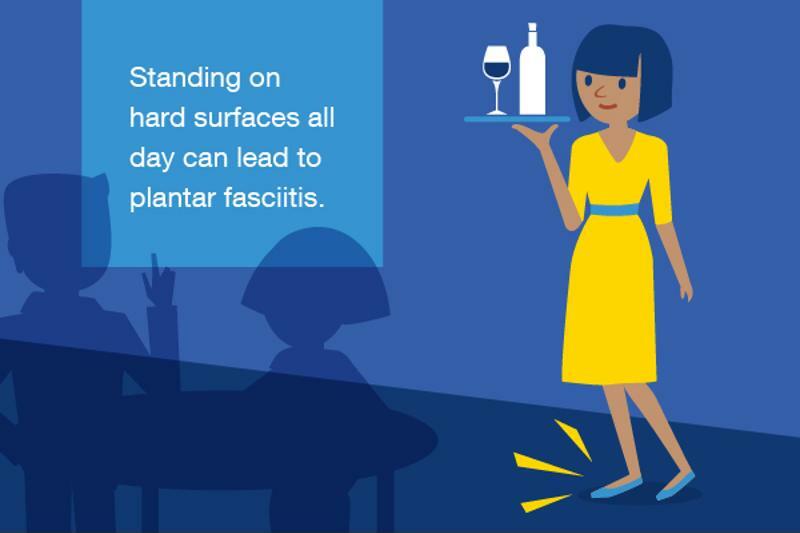 Standing on hard surfaces for long periods of time can also lead to plantar fasciitis. Remember to take breaks frequently if your occupation forces you to work on your feet all day. Jobs that require standing all day are a risk factor for plantar fasciitis. Plantar fasciitis symptoms vary from person to person, but the most common sign that you're dealing with the condition is sudden sharp, severe heel pain and tenderness of the sole of the foot, according to eMedicineHealth. Warmth and swelling in the foot that makes it difficult to walk can also be a sign that you're living with plantar fasciitis. Physical therapy – As suggested by the Mayo Clinic, seeking help from a physical therapist is a great option for those who want to learn how to stretch the plantar fascia and Achilles tendon. These instructions can help strengthen leg muscles and stabilize the ankle and heel to support the bottom of your foot. Exercise – If you don't see a physical therapist, you can still stretch and exercise your lower leg muscles. Night splints – Stretching your calf and arching your foot while you sleep is another way to relieve the pain caused by plantar fasciitis. Nice Stretch night splints offered by Brownmed can help you mitigate the condition. The Nice Stretch line has multiple options, so whether you need fixed-angle, adjustable or supplemental cold therapy, there is an option for you. There is even a daytime support sleeve for round-the-clock plantar fasciitis treatment. Cope with the pain of plantar fasciitis and purchase your Nice Stretch splint today.